Summer fun is almost over for millions American students. It’s time to put away the swimsuits, dust off the book bags and head back to school soon. 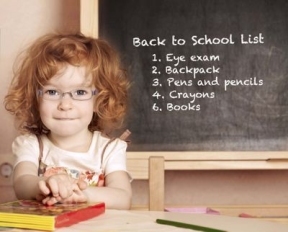 To ensure that students of all ages go to class in the best possible health, the nation’s emergency physicians advise parents and guardians to do a little homework of their own and go through a back-to-school health check list. Organize your child’s medical history records and emergency medical contact information. Provide copies of this information to your child’s school and any day care providers with instructions to take it with them to the emergency department if your child is sick or injured. The form should include information related to prescription medications, medical problems, or previous surgeries as well as pertinent family history and emergency contacts. Free forms can be downloaded on the EmergencyCareForYou website. An emergency information form is also available for children with special needs. Coordinate with the school nurse and your child’s physician to develop action plans for any health issues, such as asthma or food allergies. Communicate these plans to all appropriate care givers. Schedule medical and dental check-ups before school starts. Some children will need immunizations. Consider vision and hearing tests, since impairment can adversely affect learning. Consider a sports check-up if your child will be playing in sports. If your child takes the bus, establish a safe, visible pick up/drop off spot, preferably with a group of children and in an area where they can be clearly seen by adults. If your child drives to school, make sure he or she obeys all laws and wear seatbelts. Make sure your children know how to telephone for help. Post emergency contact numbers by every telephone in your home. Have them practice how to call 911or the local emergency number and give their names address and a brief description of the problem. Develop a family emergency plan in case something happens on the way to (or from) and while at school. Be aware of the emergency and evacuation plans for your children’s schools.